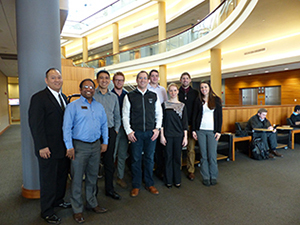 What are the benefits of partnering with Krannert on a faculty-directed student project? Draw on Krannert’s record of excellence to gain an outside perspective and complete a project that has real impact on your business. deliverables of the highest quality. Access faculty comprising world’s thought leaders in supply chain, who place Krannert among the top-ranked supply chain programs in the nation. Build your company’s reputation as an employer of choice for Krannert students and see in-depth how students on your project team might meet your future hiring needs. What makes for a good project from a corporate partner? Projects may be on a variety of topics related to operations management, including strategic sourcing, distribution planning, logistics, facility layout, location strategy, inventory management, production planning, quality management, sustainability, etc. Projects should focus on analysis of data to reach a managerial recommendation. Projects should be of a scope manageable for a team to complete in a single term. Corporate partners should be able to provide information as needed to student teams and be responsive to questions throughout the duration of the project (students and faculty assigned to a project will sign non-disclosure agreements as required). Partnering companies need not be local. Projects outside of the Greater Lafayette Area may be completed remotely or may include a combination of travel and remote work, as negotiated prior to the project kick-off. If you are interested in partnering on a project or would like more information, please contact Dr. Amy David, Clinical Assistant Professor of Operations Management, at amydavid@purdue.edu or 765-496-6526. We look forward to working with you!